The vestibule flooded with silken light and illumined dust but I saw her hesitate on the porch. The sheer curtain that blurred the outside world revealed red pants and a yellow shirt, a delicate arrangement of features. She was looking at my name plate, wondering if she wanted to ring the bell. Then she excited the chimes with one button press. I– the Lucille (Luce for short) Carmichael, Handwriting Analyst noted at my door–answered, the sweetness of cherry blossoms entering with the young woman. She was perhaps twenty, not so small but bent by a burden, whatever that turned out to be. My copper-colored tabby, a lover of classical music, took that moment to wind himself around Helen’s legs, then sauntered out the French doors. Her eyes followed him longingly. Was she a feline afficionado or a tad lonely? “Tha plants are amazing,” she noted, settling into the cushioned wicker armchair. “Towering,” she added and pointed at my ancient umbrella plant. Was she going to be another client with a hidden fear of plants that might overtake her? I had met such a one once who had to be ushered quickly into the formal living room, my least favorite spot. But no, she only turned to me, anticipating something. She was about to ask: was he no longer tending them? I could see Helen had natural curiosity, her eyes running over every inch of the space. Anxiety, as well. Her fingers clutched her purse with a delicate tremble. She had called me a month ago, inquiring about my work and then called back two weeks later, seeking a consultation. Love matters. It usually was, not matter who or what or why. “I brought his letters, only two. He sends them to me on special occasions as he knows I like that.” She unzipped her battered leather bag and pulled out two envelopes, then removed the letters and handed them to me. Her smooth brow bunched up, her brown eyes clouded. I was afraid I would have to restate the paragraph but waited. Helen nodded then closed her eyes against the brightness that filled the solarium. I could have lowered the rice paper blinds but the spring light and warmth were soothing to all living things. Sibelius trotted after me but seeing I offered no conversation, disappeared around a corner. The teas were fixed, tall blue glasses set upon a wooden tray and carried in. Helen’s eyelids flicked open. Her grandmother was the heaviness, I thought, and set our drinks on the table between us. I thought Toby a secondary issue, but wasn’t sure why. The letters were nicely written, words conveying a tendency toward romantic reassurances, his budding devotion clear in both. The handwriting was firm, rounded, each “o” and “a” full of space, slightly open at top–he might not seek all secrets but was easy-going. The “ls” were inflated as well as other upper loops–a man more often than not impelled by his feelings. The lower loop lines were longer but tidier; the mid-zone a bit uneven but in proportion to the two other zones. 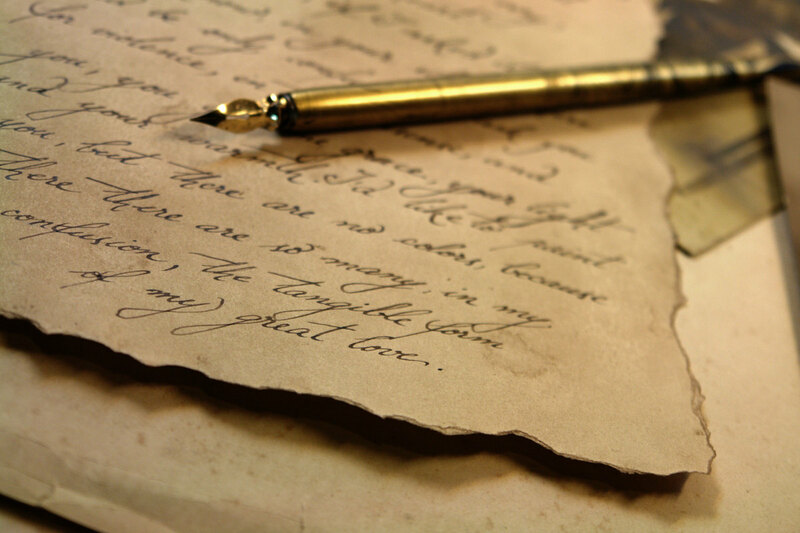 The slant tended forward more as he wrote, his emotions driving the words. The personal pronoun “I” was standard copybook, modest. His statements were heartfelt. He was vibrant–you could see that in the longer dashes of the “ts” and verve of the hand. An athlete (the lower zone reflected a very active person), yet someone who appreciated talk, just not as much as action. An uncomplicated person in a good sense. Not ambitious, more relaxed than that. He might be prone to outbursts–those upper loops nearly ballooned here and there–but not violently. The rhythm was steady but unremarkable–not a fast thinker but not slow, either. I had begun to delve deeper when I realized Helen was watching intently. I tended to get lost in my work. For that reason I preferred people mail me their samples at least a week before arriving at my door. And no emails with attachments. I had to have pages in hand. See the marks, feel the pressure of the pen’s or pencil’s tip on paper, examine it closely, even utilize a magnifying glass to discern the telltale trail from head to hand to pen to paper. Observe neurological manifestation of who they were in motion, in fact, not fancy. Or at least that is what I believed and practiced. And that was my bread and butter. But Helen had limited time, she said. I fit her in between a wearisome relative and a fan of my column from Great Britain. What was wrong with this fellow? Little that I could see. Perhaps too intense for Helen. A bit prone to sentimentality–that wasn’t a crime, was it? Loose lipped at times, as he would want to garner any allies if needed but he also he liked people. Given to surprising excessive emotion when one considered the rest of the traits. A personality that spoke of a solid young adult who had room to grow. I made it my business to pronounce no judgements, to put any personal preferences aside. I had to report only how data added up. Every mark could make a difference, even a flick or slide of a line that slipped past the controlled hand, a truncated or jagged start or finish to a word or letter that might promise something untoward and could not restrain itself for long. This is what a police department would expect me to discern and note. But Toby, this writer of love letters, was not the slightest bit dangerous. An unremarkable sort. Dependable. And not exactly inspiring great things. I took a long quaff of my iced tea. I waited. A sieve? An iron fist? A file cabinet of every right and even more wrongs? I calculated whether or not I should also add and you? but did not. Even though it seemed so, as she brushed her cheek of a tear and tried to recapture a sense of dignity. It happened here. The solarium, a refuge. My careful investigation of private places. Even Sibelius with his lovely and gentle demeanor. It’s said a handwriting expert is not unlike being a detective combined with therapist except I don’t diagnose so anyone could officially hold me to it. I have intuitions and ideas. The written word to reveal the truth. And sometimes people became too tender or have to deal with an upwelling of anger or are disoriented by the findings or talk of them, uncertain which way their world is meant to be turning. Helen had gotten hold of herself and was petting Sibelius, who then deigned to lick a finger. I found that more than disheartening: the poor young man was made a scapegoat of sorts. An impediment to a needy grandmother’s precarious sense of well-being–her flourishing mental garden notwithstanding. Her mother I could understand–she wanted so much more than she could give her daughter. But Dee? Why would she impute this child with her own greed for more? Yes, it was likely the old woman wanted security for her family before she left this world. But I would have no further concern with any of it. She didn’t respond at first. She took it all in, registering my findings and counter checking against her own list, waiting to determine if hearing his several attributes were going to make her more certain of her choice. Would Helen stick by him? I felt it more likely than not. Sibelius roused himself and jumped down, left the room as if his own work was done as guardian of books and plants, assistant to the handwriting analyst. Or he was bored and hungry. She stood up and walked around the room, paused at the umbrella plant. It was something to behold, it was true, thirty years old and a lovely survivor. I sipped my tea. Here it was, the hurt and guilt. The real dilemma. I kept thinking about grandmother’s weeds, Helen seeing herself and Toby as something un welcome, even noxious in that vast garden. How would she reconcile that with a sense of duty? Give up love that would be steadfast? Sadness found me. She never did seek any important answers from me. Helen needed someone to hear her. I was a captive listener, removed from her personal realm. Someone to confirm what she already felt she knew. She was like many of my clients, ready to know as much as they could handle, able to see truth as it suited them. Did she hear my notation about his intense emotions? Did she know this might cause her some grief one day? But she was willing to take the chance. For now. We finished our tea. Sibelius trotted up to her as she prepared to leave. I looked at her and saw her helping, taking care with details, encouraging, keeping things in balance when patients were too afraid to look to the doctors. Her mind was an inquisitive tool. Fair above all. I didn’t need her sample. I watched her stride down the pathway. Grandmother Dee was wrong about the weeds in her garden and never told her granddaughter the whole truth. Helen had a flair about her, a touch of pizzazz in her bold willingness to question, then learn. It was like the errant gift of a bright-blooming weed or an orphan plant that provides spots of unusual form or color, a good surprise. And she possessed courage that got to the essence of things. These would offset all that sturdy everyday-ness that Toby so easily offered her. They would fit together just fine. The dowager (could I think that? was it true?) Dee might even see it all come to pass. I leaned against the door. Helen hadn’t asked me about my son but that wasn’t her business, not her place. I glanced at his picture on the wall. Jack: in a boat, in Nova Scotia. One who couldn’t stay put. Off to more adventures, some foolish, some not. I wondered what he was growing there? Was there a lasting partner I might one day know? Sibelius never knew him nor did he care that I was reminiscing. He made his impatient sound and rubbed against my bare foot. I entered the white and blue kitchen to set out lunch for us both. My next client wasn’t due til three o’clock, a man seeking clues to his ex-wife’s disappearance. Yes, always love matters. It’s what we are about, beginning to end. I’m sorry I don’t speak your language, but thank you for visiting! Mi dispiace non poter condividere appieno il tuo sentire. Ho tradotto l’articolo in italiano ma la traduzione non è fedele, per cui mi sfugge qualcosa e non posso farti un commento adeguato. Anche a me piace scrivere è come una buona medicina che mi consente di andare avanti con più ottimismo e meno angosce, ciao..